The 2GB Sony Ericsson W52S Walkman phone is the largest yet in Japan. 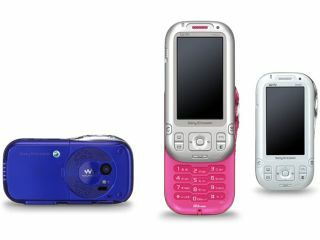 While sleek Walkman-branded music phones like Sony Ericsson's W880i do well in most of the Western world, the Japanese market seems to favour more garish, chunkier phones such as the 2GB W52S announced there today. Available from June on KDDI's au network, the biggest selling point of the W52S will, of course, be that 2GB chunk of flash memory, which is enough for close to 1,000 medium-quality tracks. Sony-brand in-ear headphones are included, as is the usual range of audio-enhancement technology. For the ¥25,000 (£105) likely selling price, there's also enough other gadgetry to make it easy to overlook the dowdy appearance of the new slider phone. Principal among these is the inclusion of an FM transmitter that allows the W52S to pipe tunes to a nearby FM radio, which is an oft-overlooked convenience. Otherwise, the 130g phone sports a 2.7-inch Bravia LCD screen, a 2.1-megapixel camera, the usual IC-based e-cash and transportation-pass functions and both Memory Stick Micro and microSD card slots. Music playback time is rated at a very respectable 110 hours.